What’s in a building name? What do the Chrysler Building, Empire State Building and Rockefeller Center have in common? The Drinkle No. 3 building is a well-known, historic landmark in Saskatoon. The iconic New York City buildings are all recognizable by name alone. They are examples of commercial real estate known throughout the world whether you’ve physically seen them or not. How significant is a name when it comes to commercial buildings? The name of a property can conjure up a variety of feelings, so it’s incredibly important to get a building name correct. Labelling a property with something that will invoke the wrong impression can make it difficult to turn around that perception later on. * eight per cent are named after unique nouns. This trend is most popular in multi-family real estate. Providing naming rights for businesses on commercial properties is still popular across North America. The best examples are most evident in sports facilities. What I found surprising was the decline in using names of individuals or families; locational references are now more common than names lost to history. Locational or address related properties make sense if you’ve got a property near a landmark or local point of interest. Major arterials like Saskatoon’s 8th St. and Circle Drive have been monopolizing this trend for years. Crombie REIT’s (CRR.UN-T) River City Centre is near Saskatoon’s beautiful municipally developed river landing boardwalk. Spadina Towers is predictably found on Saskatoon’s Spadina Crescent. The newest residential condo development rising on the river is No. 1 River Landing. It doesn’t get much easier to find than that! If you’re hoping to arrive at a name that will stand the test of time, locational names seem to have more resilience to trends and staying power in the long run. In Saskatoon, there are very few buildings still named after individuals. But they did exist at one time, just like the Rockefellers of New York. The Drinkle building is one that still stands today. Named after John Clarence Drinkle, he arrived in Saskatoon in 1903 with no more than $500 to his name. He was an original boomtown entrepreneur. He set up a real estate office when the community had a population of only 500. Drinkle built three office buildings, of which only Drinkle No. 3 still exists at 117 3rd Ave S. Now owned by Pelican Properties, the building not only recognizes Drinkle’s influence but capitalizes on it. 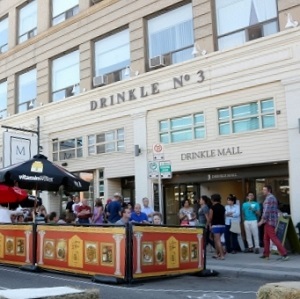 Though the Drinkle name has long outlived any kin in Saskatoon, the name still drums up a sense of sentiment because the current owners have made sure his spirit lives on.